This is not a photo from the full-text of the study, but it could be. After all the energy deficient diet was >90% below the maintenance intakes of the subjects. That's unfortunately much more severe than the average dieter's approach, but some of the things the scientists observed still have very general applications. If you've ever dieted to make the cut in a sports with weight classes, you will know this insatiable hunger which climaxes on the last two days when you are down to a handful of calories per day. It's a hunger that won't be satisfied even if you eat an extra 1000 kcal above maintenance. Athletes competing in sports with weight classes may need to accept the post-dieting binge, but what about average Joes and Janes? 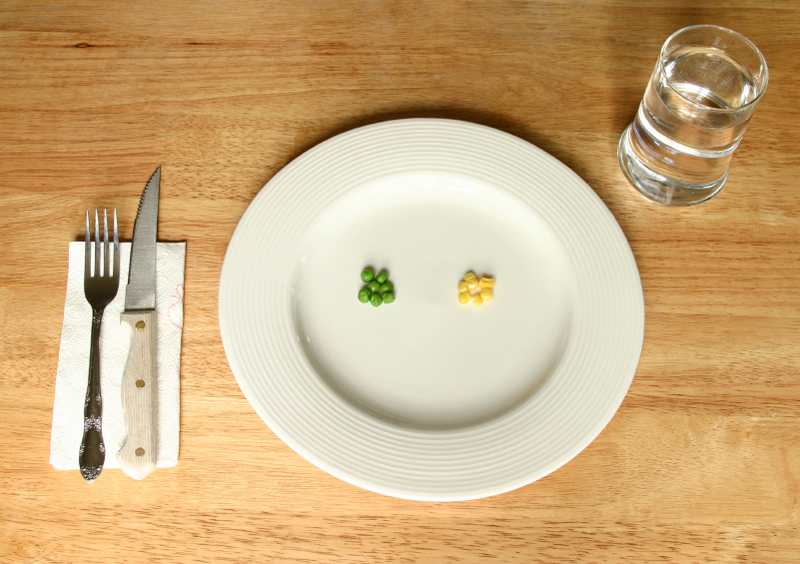 Will a fasting day ruin the average dieters dieting efforts by making them eat more extra-calories on day 2 than they've economized the day before? A recent study from the US Army Research Institute of Environmental Medicine, in which scientists have attempted to stimulate and simulate this insatiable hunger in a tightly controlled experimental environment, may hold the answer. 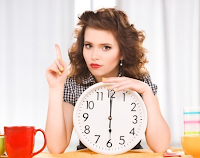 Do you have to worry about fasting when your're dieting!? Fasting Works for Obese, Too!? Does the Break- Fast-Myth Break? As Kristie L O'Connor et al. point out an altered secretion of appetite-mediating hormones is the #1 candidate to explain the common tendency for weight regain (Sumithran. 2013 | see Figure 1). This hypothesis is supported by several studies that have reported decreases in circulating leptin and insulin concentrations in response to weight loss that are disproportionately greater than contemporaneous reductions in fat mass (Mars. 2005; Blom. 2006; MacLean. 2006; Pasiakos. 2011; Sumithran. 2011). Other studies have documented blunted postprandial gastroenteropancreatic hormone responses after weight loss (Chan. 2004). Figure 1: Selected pathways involved in body weight regulation (left) and tabular overview of physiological changes after diet-induced weight loss and their effect on energy intake and storage (right | Sumithran. 2013). Scientists have speculated that these ill effects may be countered by eating diets with a low energy density and thus putting equivalent stress on the gastric mechanoreceptors in our guts. Unfortunately, this alone has turned out to be as ineffective as other attempts to minimize the adaptive response to energy restriction. On the other hand, the existing effects the volume of what we have will have on our satiety is something that has been overlooked in previous studies. Figure 2: Study design. EB, energy balance; ED, energy deprivation; EE, energy expenditure; EI, energy intake; RMR, resting metabolic rate; TDEE, total daily energy expenditure; VAS, visual analogue scale (O'Connor. 2016). Overall, our understanding of the complex relationship between what and how much we eat and how this affects our subjective satiety and corresponding hormone response is still very limited. To address this knowledge gap O'Conner et al. created 2 isovolumetric diets that differed in energy density but were otherwise comparable in taste, texture, and appearance that were fed to healthy young adults during a period of energy balance (EB) and a period of 90% energy deprivation (ED), in oder to "examine the physiologic effects of short-term ED on appetite-mediating hormones and appetite independent from reductions in diet volume" (O'Connor. 2016 | see Figure 2). It is a common misunderstanding that you "must" lose your weight slowly: While most mainstream diet advise involves the recommendation that you shouldn't reduce your energy intake too significantly and that you must lose your weight slowly, the existing peer-reviewed experimental and observational evidence does not support the notion that (a) slow eight gain would support greater lean mass retention or (b) prevent weight regain. Learn why that's the case. 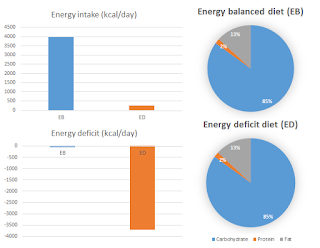 Figure 3: Overview of energy intake, deficits and macronutrient composition in the two study groups (O'Connor. 2016). 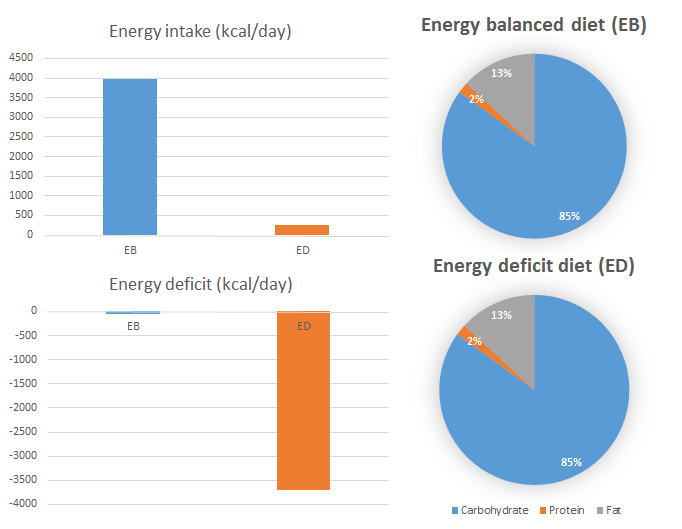 As the scientists had expected the energy deficit that was induced over two seperate 48-h periods during which the energy intake was matched to energy expenditure to maintain energy balance (EB) (-44 +/- 92 kcal/d) or yield less than 10% of the energy the subjects required (ED). In conjunction with the low-to-medium intensity exercise regimen (0–65% VO2peak for 187 6 +/- 21 min/d) that burned an extra 1683 +/- 329 kcal/d, the ED group did thus end up having a whopping -3696 +/- 742-kcal/d deficit on each of the two days (!). It is thus no wonder that the scientists observed a whole host of significant differences in the hormonal response to the "diet" (diet vs. fasting). 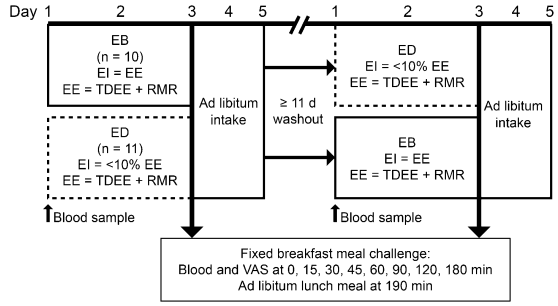 One difference you probably know much better however, is depicted in Figure 4, which shows that the subjects in the ED group consumed not simply the amount of energy they needed on the subsequent ad-libitum meal condition, but an extra 811 kcal - and they still felt a significantly greater desire to eat right after and 180 minutes after the meal. indicates the time at which the ad-libitum meal was served (O'Connor. 2016). Unfortunately, the complexity of the hormonal changes does not allow us to identify this one parameter we could target to counter this effect. With significantly reduced fasting insulin (256% 6 42%) and acyl ghrelin (260% 6 17%) concentrations, as well as leptin concentrations that decreased more during ED compared with EB (-47% 6 +/- 27% compared with -20% +/- 27%; P-interaction = 0.05), we have two three (expected) candidates that could explain the increased hunger and desire to eat before the ad-libitum meal. The increased postprandial insulin (57% +/- 63%; P < 0.001), GLP-1 (14% 6 28%; P = 0.04), and PP (54% +/- 52%; P < 0.001) areas under the curve (AUCs), as well as the reduced acyl ghrelin increase (-56% +/- 13%; P < 0.001) after ED compared with after EB, on the other hand, appear to contradict the lack of satiating effect of the 1834 kcal lunch in the 18–39 year-old healthy men and nonpregnant women who participated in the study at hand. Intermittent Fasting Works, But is It Better Than "Regular" Dieting? What Do the Latest Reviews / Meta-Analyses Say? Find out in this SuppVersity Classic! So what can be done? Well, the increase in appetite and desire to eat is probably a generally unavoidable effect of "starvation diets" and since this is what the study at hand focuses on, it is difficult to predict how pronounced the effect would have been if the ~3500kcal energy deficit, the subjects in the study at hand reached within just one day, would have been induced over the course of 3-5 days. A dieting approach like that would after all been much closer to what the average dieter does over the course of 3-5 days only to then overeat and fall off the wagon on the weekend. In addition, a lower calorie deficit may have (a) made it easier to identify what exactly it is that causes the rebound effect and may (b) have been insufficient to compensate for the binge. This leads us directly to the most important result of the study at hand: As suboptimal as the diet may be, one significant and probably mostly underappreciated result of the study at hand is that - once again - the energy deficit you accumulate during a quasi-fast was not fully compensated for over the 36h follow up period. A fact that adds to the existing evidence in favor of cyclic diets as every-other-day fasting, where you cycle hunger and ad-libitum diet days | Comment! Blom, Wendy AM, et al. "Fasting Ghrelin Does Not Predict Food Intake after Short‐term Energy Restriction." Obesity 14.5 (2006): 838-846. Chan, Jean L., et al. "Ghrelin levels are not regulated by recombinant leptin administration and/or three days of fasting in healthy subjects." The Journal of Clinical Endocrinology & Metabolism 89.1 (2004): 335-343. Egecioglu, Emil, et al. "PRECLINICAL STUDY: FULL ARTICLE: Ghrelin increases intake of rewarding food in rodents." Addiction biology 15.3 (2010): 304-311. MacLean, Paul S., et al. "Peripheral metabolic responses to prolonged weight reduction that promote rapid, efficient regain in obesity-prone rats." American Journal of Physiology-Regulatory, Integrative and Comparative Physiology 290.6 (2006): R1577-R1588. Mars, Monica, et al. "Decreases in fasting leptin and insulin concentrations after acute energy restriction and subsequent compensation in food intake." The American journal of clinical nutrition 81.3 (2005): 570-577. O'Connor, et al. "Altered Appetite-Mediating Hormone Concentrations Precede Compensatory Overeating After Severe, Short-Term Energy Deprivation in Healthy Adults." Nutrient Physiology, Metabolism, and Nutrient-Nutrient Interactions (2016). Pasiakos, Stefan M., et al. "Appetite and Endocrine Regulators of Energy Balance After 2 Days of Energy Restriction: Insulin, Leptin, Ghrelin, and DHEA‐S." Obesity 19.6 (2011): 1124-1130. Sumithran, Priya, et al. "Long-term persistence of hormonal adaptations to weight loss." New England Journal of Medicine 365.17 (2011): 1597-1604. Sumithran, Priya, and Joseph Proietto. "The defence of body weight: a physiological basis for weight regain after weight loss." Clinical Science 124.4 (2013): 231-241.